The D1000 and D2000 Series single channel data acquisition system and digital transmitters are a complete family of easy to use interface modules for personal computers and other processor based equipment with standard serial I/O ports. The modules convert analog input signals to engineering units and transmit, in ASCII format, to any host computer with a standard RS-232C or RS-485 port. This modular design enables anyone familiar with a personal computer to construct a flexible and cost effective data acquisition system. These modules can measure temperature, pressure, flow, voltages, currents and various types of digital signals. 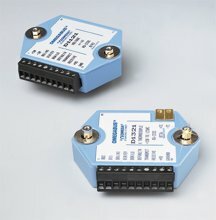 The D2000 series of user programmable single channel data acquisition and control modules allow direct interface of non-linear analog sensors to computers with serial I/O ports. Use of these modules enables downloading up to 23 breakpoints through the communications port. With these breakpoints the user can program a module to virtually any transfer function.